Before Interstate 89 was re-routed through Lebanon, the largest local community of Jews was in Claremont; it had its own synagogue building! In 1963, when I came to Dartmouth as a first-year student, the College’s “Jewish Life Council” was located within the Dartmouth Christian Union. Occasional services were led by lay persons. In the mid-1970’s, I participated in a “steering committee” of Jewish community members discussing how to strengthen Jewish life in the Upper Valley; for many years thereafter, the governing body of the UVJC was called by this name. Among our first major decisions was to hire spiritual leadership before investing in bricks and mortar, believing that building our Jewishness inevitably would lead us to the strength we’d need to support a physical center. To hire our first rabbi, a sharing agreement was forged with Dartmouth College which continues to provide both Jewish students and Jewish community members with access to rabbinical leadership. Though the specifics of this agreement have changed over the years, the mutual commitment has strengthened the College’s and the Community’s ability to offer a full Jewish experience to their constituencies. 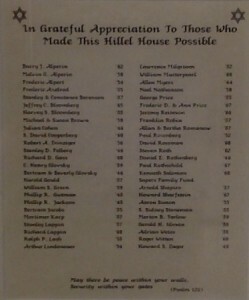 As in every pioneer Jewish community, formal education of the UVJC’s children was a key community building block. Many of us having little more training than our children, devoted our time to learning just enough to keep ahead of the grades we taught so that our children would learn Jewish history and customs, and be exposed to our sacred language. We moved the UVJC school from Lebanon’s Seminary Hill School, to the Day Care Center of Norwich, to a little College-owned house on Summer Street. How we have grown into today’s educational institution, offering enriching multiple weekly sessions for children from pre-school through Bar and Bat Mitzvah age and beyond! In the late 1990’s, the Trustees of Dartmouth College created the Foundation for Jewish Life at Dartmouth to build and endow a Center for Jewish Life serving Dartmouth students, faculty and staff, together with non-Dartmouth affiliated Upper Valley Jewish families. 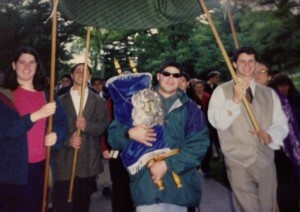 We dedicated the Roth Center in November of 1997 with a ceremonial Torah procession from the little house on Summer Street, departing forever from our itinerant past. Establishment of a cemetery committee led to acquisition of a half-acre of land in the city of Lebanon, consecrated in 1992. UVJC burial policies were created to serve the needs of all members of our eclectic Jewish family, from the most observant to the mostly secular. 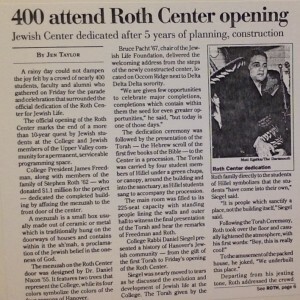 Today’s UVJC is rooted in the Roth Center. Our rabbi provides counseling, support and leadership in the Jewish tradition for Jews of all levels of observance. Educational opportunities for our children, teens and adults expand each year. You, too, are welcome to join in the fun!